Karbonz needles are a revolutionary new product!! 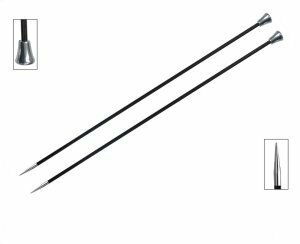 These needles are constructed of light bodied carbon fiber, so they have high tensile strength, making them very difficult to break. Carbon fiber is a versatile material that is used to manufacture the new generation aircrafts, space ships, automobiles, etc.! The shiny, smooth brass tips come in perfect points and are flawlessly tapered. These needles are guaranteed to provide an unparalleled knitting experience. No other knitting needle comes close to this! The size range from US 0 (1.50mm) to US 10 (6.0mm). Knitter's Pride Zing Single Pointed Needles and Brittany Birch Single Point Needles are both similar needles: 13.75" / 14" (35cm), straight, and US 6 (4.0mm) US size. You may enjoy taking a look at the Rowan Alpaca Merino DK Longdendale Vest, Rowan Selects Denim Lace Hermia Pullover, Rowan Cotton Glace Bountree Cardigan, and Rowan Kidsilk Haze/Fine Lace Eva Cardigan kits all using Knitter's Pride Karbonz Single Point Needles.